Belal Hossain Biplob: Rajshahi University is the second largest tertiary level educational institution in the country and it is the highest seat of learning in the northern region of Bangladesh. Over last glorious 6 decades, a good number of students and teachers from this university have displayed their ingenuity and intellectual potentiality in respective fields throughout the world with fame and acclaim. The Rajshahi University is stridden into its 65th year on July 6, 2017.Through a history of ups and downs, the university is laying pinnacle of higher studies (a bustling center of higher studies), with a large number of highly qualified teachers, administrators, and promising students. The University has launched the journey on July 6, 1953. Since then the institution has been rendering a commendable service in the field of higher education, research work and disseminating knowledge in accommodating every year about twenty-five thousand students. The Foundation of the varsity was an outcome of the demand and series of movements of the people of all strata of the city. A reputed lawyer and landlord of Natore, Madar Bux, and the member of the East Pakistan Legislative Assembly, Abdul Hamid, a prominent educationist and Sheikh Ansar Ali, a retired judge led the movements at that time. 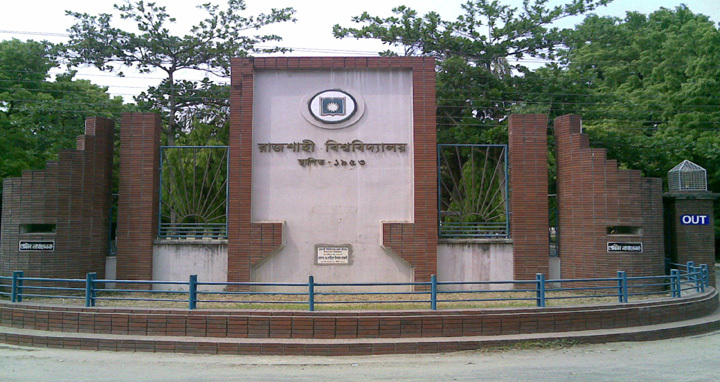 In the wake of consecutive movements, the Rajshahi University Act 1953 (East Bengal Act XV of 1953) was passed by the East Pakistan provincial Assembly on March 31, 1953. On July 6, Prof. Itrat Hossain Juberi, a noted educationist and the Principal of the then Rajshahi Govt College was appointed the founder Vice Chancellor of the university and it started functioning in 1954. Though the university established in 1953, actually its normal academic activities started in 1954. Initially, six academic disciplines- Bengali, English, History, Philosophy, Economics, and Law were introduced. Simultaneously a discipline on education (BT) was opened but failed to continue a few years later. At the initial stage, 12-degree colleges and 8 intermediate colleges were affiliated to this university. It started its academic activities with only 161 students, 5 of whom were girls and a total of 20 teachers. Since its inception six disciplines- Bengali, English, History, Law, Philosophy, and Economics were introduced while the number of students was 161 including 5 female students and that of teachers was 20. At that time academic and administrative activities were held at different building including Fullar Hostel of Rajshahi, College, Historical Bara kuthi, B.B. Hindu academy, the house of Mitra Mahashoy, and 18th centuries Dutch Trading house. The varsity moved to its own campus during 1961 to 1964 after the construction of academic, administrative and residential Bhabans. According to Colombo plan, Australian architect G. Swani Thomas in association-With John A. Ziamanek designed the infrastructure of the university comprising about 303.80 hectres of land including Narikelbaria Agriculture unit. The problem of accommodation was solved in 1961 when the university was shifted to its own campus at the “evergreen” Motihar. Administrative activities resumed after the completion of present administrative building in 1964. The first Science Building was the first academic building and the only tin-shed Motihar hall was the first residential hall of the university According to Colombo Plan, Colonel G. Swani Thomas, MA designed the infrastructure of the university. A famous architect Jhon A Zimanek assisted him. Australian architect G Swani Thomas, in association with John A Ziamanek, designed the infrastructure of the university. It covered about 303.80 hectares of land including the Narikelbaria agriculture unit. Administrative sources said in the past 64 years history of the university over 169 thousand students obtained their graduation and post graduation degrees. More than 1621 scholars across the country have been awarded with M.Phil and PhD degrees from here. It has now 57 academic departments under night faculties, 6 higher research institutes and 17 residential halls with single dormitory for MPhil and PhD fellow. Above 25,000 students are studying here and about 1,250 teachers are engaged in imparting knowledge to them. RU has held nine convocations so far. RUCSU (Rajshahi University Central Students Union) elections were held 15 times and remained suspended for 18 years. The students and teachers of RU have always been conscious to resist all injustices. They never lag behind to play vital roles in different democratic movements. For instance, their movement for the cancellation of the report of disputed education commission of 1962, mass uprising of 1969 for democracy and above all active participation in the war of liberation in 1971 are remarkable in the history of our country. During the massive movement of 1969, the students of this university became furious and Dr. Shamsuzzoha, the then Proctor, sacrificed his life to save them from the so-called law-enforcing agency. Now accommodation crisis is the main problem in the campus as only about eleven thousand seats are available in 17 halls against 25000 students. Apart from acute accommodation crisis, session jam, lack of modern facilities in the transport, Medicare, and computer as well as well organized Science laboratory and books in the central library are the major obstacles for students and teachers due to budget deficit and financial crisis. Prof. ANM Jahangir Kabir, a senior teacher of Management Information System (MIS) Department said Congenial atmosphere of study and research is very supportive, to eliminate session jam and improve the standard of education and research of a varsity. So the university should be take some steps to improve the standard of administration and academic manpower through various training programmes including computer course, office management. Dulal Uddin, Asadulla Hil Galib and Md Rasel students of business studies faculty expressed to holding of RUCSU election soon. They demanded assuring to maintain peaceful co-existence among the students bodies at the residential halls despite differences of their political ideology and affiliation. While contacted with university registrar Prof. MA Bari said present university authority will take all necessary initiatives to enhance the standard of education and eliminate session jam restoring congenial atmosphere in the campus. He also vowed to free the campus from terrorism and stressed the need for mutual understanding and fellowship development among the students, teachers as well as leaders and activists of different political bodies to avoid chaos and conflict.